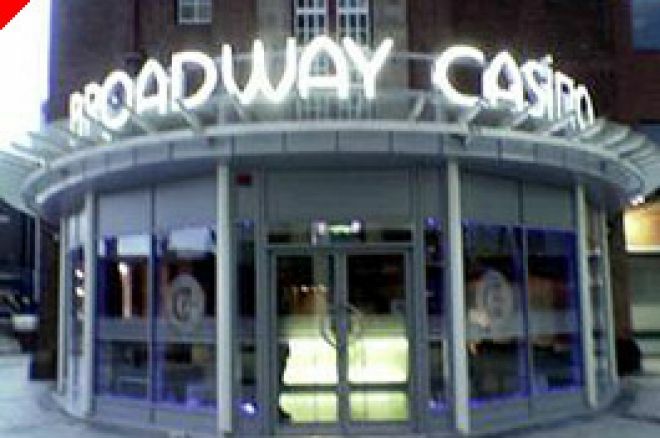 Birmingham's Broadway Casino started their Heart of England Festival yesterday with a small "warm up" event. Even so, this still attracted a strong field from the midlands. With a busy February poker schedule announced in the UK and indeed, Europe, Broadway Casino were taking on the likes of the Steel City Cup festival in Sheffield, the Brighton Festival of Poker and Bregenz Open in Austria with their week long festival. If the Monday turn-out is anything to go by, then for the rest of the week Broadway need have no fears about players turning out. The Monday evening start time of 8pm was one hour earlier than the usual. This caught a number of players out. The 83 seated, for this £25 No Limit Hold 'Em re-buy tournament, would surely have been in excess of 90 players had everyone been aware of the earlier kick-off. A number which nears the Broadway card room capacity. Poker is seemingly being taken more seriously by the Broadway powers that be. The poker dealers are now clothed in a bright yellow shirt to make them more distinguishable from the gaming floor staff. The player numbers, average chip count, buy-ins, re-buys, add-ons and prize money are all viewable on the large plasma screen in the centre of the card room and the staff are very professional and approachable. Despite the departure of Richard Wooten, the former card room manager, poker continues to be one of the most popular areas in the Broadway Casino. The rest of the week looks very attractive for the No Limit Hold 'Em player. The full schedule, which can be found on our Poker News UK Poker Tournament pages, culminates in the £1000 main event on Saturday 18th February. The final of which takes place the following day at 3pm. UK Poker News will have a full results service round-up from the busy February schedules towards the end of the month.